Geiseric (428–477) was certainly the most important of the Vandal kings, and indeed was among the most influential figures of the fifth century Mediterranean world. It was under his watch that the Vandals crossed into Africa, and secured the two imperial treaties of settlement in 435 and 442. He established the position of the Vandals as a major naval power by commandeering the Carthaginian merchant marine, and was able to spread Vandal authority into Sicily, Corsica, Sardinia and the Balearic Islands. Fall of Carthage to the Vandals aggrieved the western and eastern empire, as there was a large number of galleys and a great shipyards in Carthage, creating the Vandal fleet as the equal to the joint navy of the two empires. That the empire ever allowed for so many galleys to be left in Carthage's port while the Vandals were so close by, must be one of the most monumental blunders of its history. For the first time in nearly 6 centuries, Carthage became the greatest danger to Rome since the Punic Wars. AD 468 witnessed the most ambitious campaign ever launched against the Vandal state in Africa, which deserves admiration for its logistical brilliance, if not its eventual result. A massive naval operation, under the command of the emperor’s brother-in-law Basiliscus, lay at the heart of this offensive, which was intended to strike directly at the Vandal capital. The statistics for this campaign given by sixth- and seventh-century historians are clearly grotesquely exaggerated, but even if we can reject Theophanes’ assertion that the fleet numbered 100,000 ships or even John the Lydian’s more modest (but still unlikely) figure of 10,000 ships, it is clear that the logistical operation was massive. Marcian ordered the extensive requisition of merchant shipping in eastern ports, including considerable numbers of Carthaginian vessels. Simultaneously, western troops were mustered under Anthemius or Ricimer, and Sicily was again taken by Marcellinus and his barbarian federates. The mobilization of this campaign startled the inhabitants of Carthage into action. The Suevic and Gothic envoys in the city fled, and Geiseric rapidly deployed his own legates in an attempt to make peace. Quite what happened next is unclear, but Geiseric’s overtures apparently had some effect. In the early stages of the campaign, the imperial forces enjoyed some success, and may even have defeated Vandal ships sent out to intercept them. Crucially, however, Basiliscus delayed the crucial landing operations and kept his ships anchored at Mercurium off the African coast for five days. Various explanations for this delay circulated among later historians. Some suggested that Basiliscus had simply been bought off by Geiseric, others that Aspar had promised him the eastern throne if he agreed to sacrifice his fleet to the Vandal allies of the magister militum. Whatever the cause, the delay proved to be fatal. After a long stand-off, a shift in the wind allowed Geiseric to launch a fire-ship raid on the becalmed fleet. The effects were devastating. Basiliscus’ vast armada was scattered and the opportunity for a crippling blow at Carthage was lost. 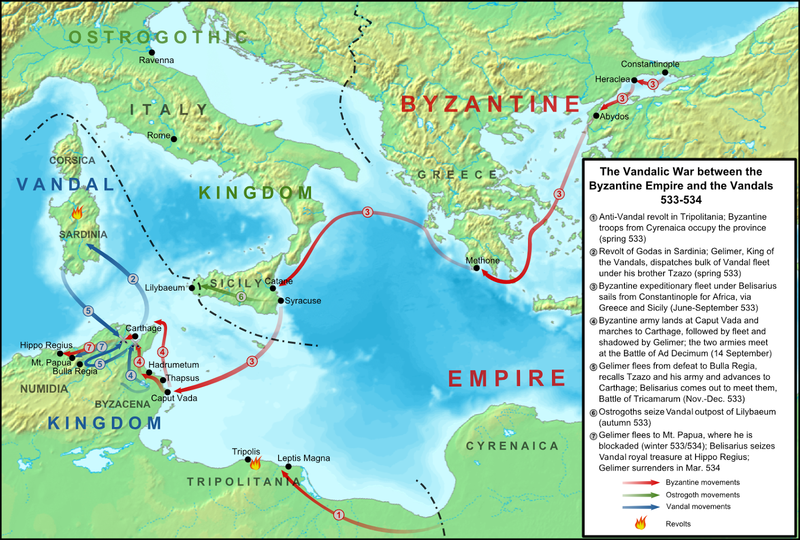 As Basiliscus led his fleet towards the cataclysm of Mercurium, and Marcellinus occupied Sicily, a third front was opened up on the southern frontier of the Vandal kingdom. Drawing his army from the Byzantine troops and federates of Egypt, Heracleius led an expedition by sea against the Vandal coastal stronghold of Tripolis. Heracleius occupied the city, and then followed an overland route towards Byzacena, with the intention of uniting with Basiliscus in the Proconsular province. This expedition would have represented a considerable threat to the Vandal kingdom, but it seems to have been halted by news of Basiliscus’ defeat. Apparently demoralized, Heracleius led his army back to the relative safety of Tripolis. Tripolis remained in Byzantine hands until 470 when military pressures on the Balkan frontier, and political infighting at court, required that the troops in Africa be withdrawn. A formal peace treaty was probably signed in the same year.